So here we are at the end of the HTC One X battery test and we are ready to share the results with you. If you wonder how efficient that Tegra 3 4-PLUS-1 architecture is and whether the companion core makes up for the four power-hungry ones, here is the place to find out. The HTC One X bright 4.7″ HD LCD is certainly hard to feed, but you can’t blame the huge 1800 mAh power pack for lack of trying. As usual, we started with the talk time test, which saw the One X deliver its best performance of the whole test. With the screen staying off the whole test, the large battery mattered big time and helped the One X survive for nearly 10 hours on a single charge. Sadly, the web browsing performance wasn’t so inspiring and the One X fully charged battery went flat merely 4 hours and 18 minutes after the start of the test. The high resolution really makes browsing a joy, but it comes at a price. The HTC One X put up a more respectable performance in the third test – SD video playback. With the companion core proving more than enough for the task, the smartphone took 5 hours 45 minutes to lose 90% of its charge. We came to the final and most important result in our test. 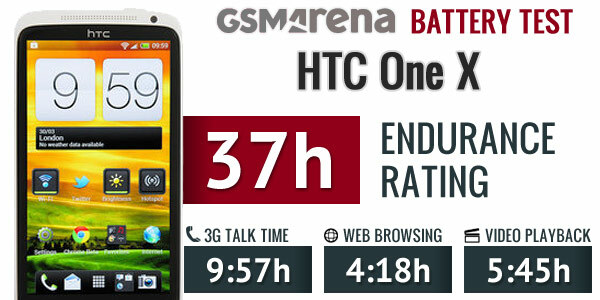 The HTC One X got an endurance rating of 37h, which suggests you will only need to charge it once every 37 hours if you use it for an hour of each of the three activities per day. While 37h isn’t the highest rating we have seen, it’s more than an acceptable score, given the screen size and the resolution of the One X. We guess anyone who doubted the battery life of the Tegra 3-packing smartphones and the efficiency of their quad-core processors should now breath a sight of relief. You can find more about the test itself here.